VFD High Visibility Display - HI/LO limits display - 100 set points values -100 updates /sec. The high speed F800 weigh batch controller is designed to provide efficient production control functions in a wide variety of applications. The panel-mount configuration uses only 5.12" W x 8.15"H of panel real estate, which offers maximum mounting flexibility. As a batching controller the F 800 uses its high speed to provide unmatched accuracy. The power supply can excite / power up to four 350 ohm load cells (or eight 1000 ohm). Applications can include: hopper scales, packing scales, multi-ingredient batchers, bag filling, and others systems that require high speed and accuracy. Strain gage sensors can be connected directly to the F800. a 10V excitation voltage provides the power for the strain gauges in your application. Up to 100 coded groups of set point values can be preset in the F 800. Each group can include the following information, SP 1, SP 2, FINAL settings, Compensation CPS, OVER, UNDER, and also an Auto Free Fall compensation selection. Set points can operate in two separate modes, simple comparison, or sequential. Finally the set points values have many functional modifiers that can be selected to "fine tune" a system. Timers, filters, start points, and start/stop signals are all available for selection. 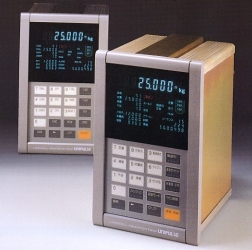 The bright VFD display is ideal for dim lit manufacturing areas. A weight tracking screen with upper and lower limit comparisons, and a small graphic filling representation is an aid in the initial start up sequence and for the operator who is system troubleshooting. NTEP approved, the system accuracy (non-linearity) is 1 part in 10,000 divisions (0.01% full scale) legal-for-trade, or 1:40,000 expanded resolution mode. Calibration is simple, and special situations like system dead load (mounting plates, hoppers, etc.) can be compensated for by a front panel entry. The F800 accumulate function continuously updates material throughput and provides a supervisor or operator with a quick front panel summary of the total(s). A standard serial communication protocol (SI/F) is included in each instrument. By using the SI/F interface the F800 can be matched with UNIPULSE remote displays, and statistical printers. If more communication capabilities are needed then a series of Optional Communication Packages are available. These include: RS232, SI/F2, Analog outputs (0-10V or 4-20mA), DeviceNet (ODVA approved), Compro Bus/D (OMRON), CC-Link (Mitsubishi), RS485, and BCD (In or Out).